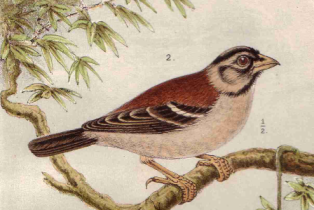 There are four species of sparrow-weavers. The sexes are similar and they are brownish above and white below with a prominent eye-stripe. They are found in dry savanna country. The diet is seeds and insects, taken mostly on the ground. They are found in small flocks. 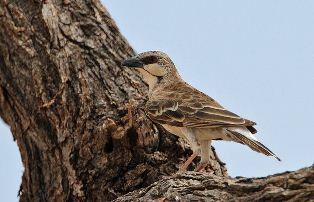 Sparrow-weavers are monogamous, co-operative breeders. They build conspicuous nests of grass stems, usually in thorn trees. The nests have two entrances, but one is closed in breeding nests. The eggs are whitish, cream, or pinkish and usually marked. 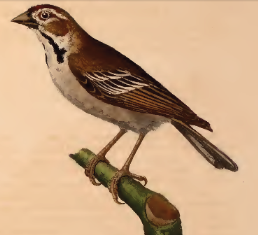 The range of the White-browed Sparrow-Weaver overlaps with each of the other three species, while the other 3 species do not overlap with each other (although Donaldson-Smith's Sparrow-Weaver and Chestnut-crowned Sparrow-Weaver nearly meet in Kenya and Ethiopia).